Color(s): All colors are permitted except white, mouse grey, patches, dappled, or black and tan. 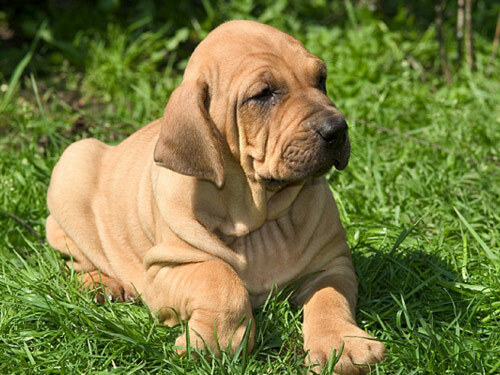 A powerful and courageous breed, the Fila Brasileiro is a loyal and dedicated companion animal. The Fila Brasileiro has strong protective instincts of his owner and territory, but very loving. This breed should be kept on a lead at all times as they are very protective and can become aggressive given the situation. Socialized from puppyhood, the "Fila" does well with children providing they do not overly pester. Confident, self-assured, and a calm disposition make the Fila Brasileiro ideal for someone looking for a protective yet docile pet. Commonly used as a guard dog. The Fila Brasileiro is not for everyone. This breed is very powerful and can prove to be quite a handful for the average pet owner. Proper breeding is a must to create a mild-tempered dog. The Fila Brasileiro can become aggressive if he feels threatened. Brushing with a firm bristle brush will be sufficient for this shorthaired breed. Average shedding, a wipe down with a damp washcloth should remove any loose hair. Bathe only when necessary. The Fila Brasileiro should be protected from cold weather considering the very short, smooth coat. This large breed has a very short coat and little to no maintenance is sufficient. The Fila Brasileiros coat should be smooth, soft and dense, being somewhat weather resistant. This powerful dog is not recommended for a first time trainer. Obedience classes are recommended, and required at times. The Fila Brasileiro can be difficult to control. Dominant owner required if dog is to be well mannered and obedient. A fenced in large yard is required for this large and lively breed. Recommended for country living, the Fila Brasileiro can also do well in home life if given sufficient exercise. Requires regular walks and free roaming exercise.